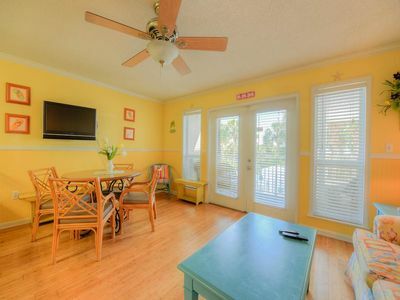 Beautifully decorated unit in Gulf-front Building! ***UPDATE****Our building (Blue Lupine) is currently undergoing a major renovation. All the atrium pictures included in this listing are not representative of what it will look like in Spring/Summer 2019. 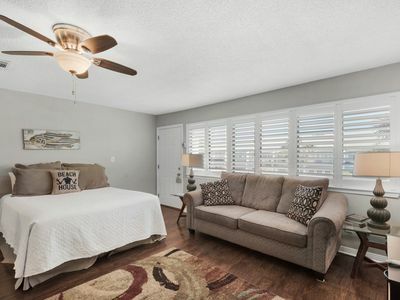 This is a comprehensive interior renovation and includes all new floors, paint, carpet, tile, elevators, interior furniture and remodeled common area restrooms (including the pool restroom accessible from the pool/ocean). Unfortunately, we do not have any renderings available at this time but all the interior selections have been made by one of the coast's leading professional designers. 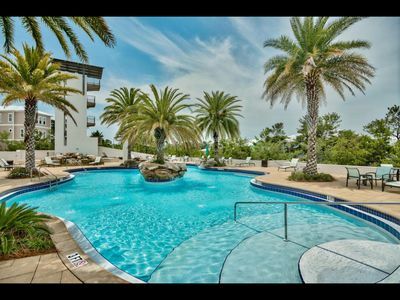 Our owner community here at Blue Lupine is excited about these updates and we believe it will enhance your stay at our property. Construction is to be completed March 1 and new elevator installation by March 15, 2019. Rates for the building are expected to increase after construction is completed, so book now for Spring and Summer! 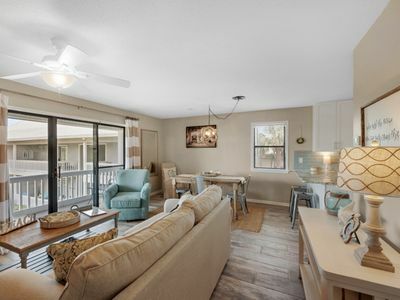 Perfect for family and friends, our Gulf side, 3 bedroom, 3 bathroom condo is located in Blue Mountain Beach, a quiet beach community minutes from Seaside and Sandestin. Blue Lupine sits directly on the beach. Hidden right off of the south side of Highway 30-A, enjoy all that these beaches have to offer without being right in the middle of all the crowds. 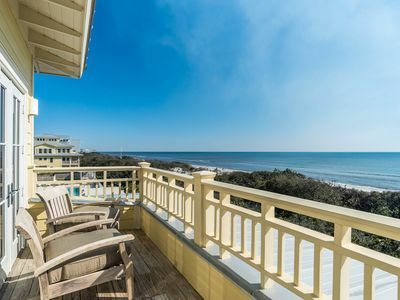 Our unit is on the third floor featuring beautiful panoramic western views of the gulf, highlighting incredible sunsets. The master bedroom features a king size bed, walk in closet, bathroom with shower and Jacuzzi plus a private balcony. The second guest bedroom contains a queen size bed, private bath and opens onto the main balcony. The third bedroom has two bunk beds (sleeping 4) and shares a full hall bath. 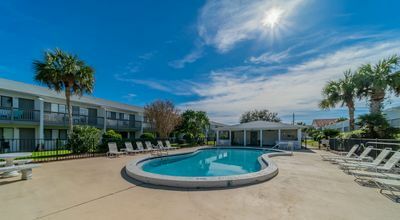 All bedrooms have ceiling fans, flat screen tvs, queen bedroom has a dvd player, and twin bedroom has a Wii for kids movie watching and gaming. For extra guests, the living room sofa converts to a queen size bed. For our younger guest, we have a pack 'n' play and high chair. We are sure you will spend a lot of your time on the spacious main balcony. Enjoy the gulf breezes while dining or just relaxing in our comfortable outdoor furniture. Every last detail has been thought of to make your stay more enjoyable. There are games, cards, a bin full of beach toys and even crab nets! There is also additional storage in the queen and master baths for your toiletries and hairdryers are provided. A starter package of kleenex, bath soaps, dishwasher tabs, laundry tabs, hand soap, sponge, lysol wipes, extra roll of paper towels and toilet paper and coffee & tea are provided, so there is no need to rush out to the store right when you arrive. 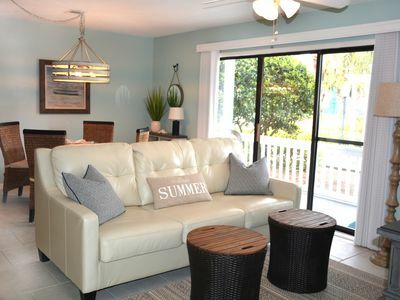 The open living plan features a large seating area, flat screen tv with a premium cable package and Netflix. There is also a dvd player. High-speed wireless Internet access is provided for the building. 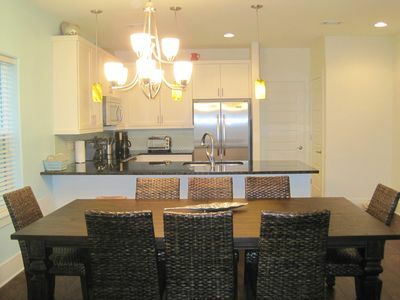 In addition, there is a fully equipped kitchen with seating for 3 at the bar. The dining room table seats six. 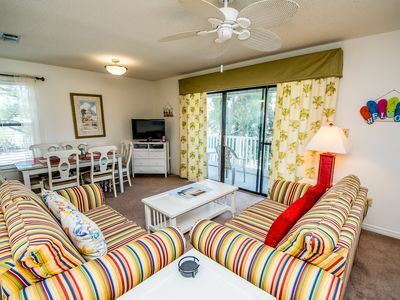 High quality linens are provided as well as a washer and dryer inside the unit. 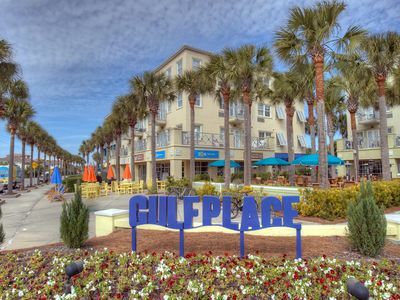 Blue Lupine is a charming 48 unit complex on the Gulf of Mexico located between two private upscale home developments and adjacent to a protected conservation area. Each unit opens onto a 4-story, sky lighted atrium filled with tropical plants and seating areas. Elevators located at either end of the atrium provide comfortable access from the gated underground parking garage. 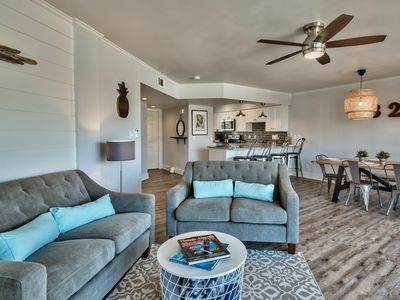 Blue Lupine is convenient to nearby grocery stores, outlets and other unique shopping, outdoor activities and dining options. 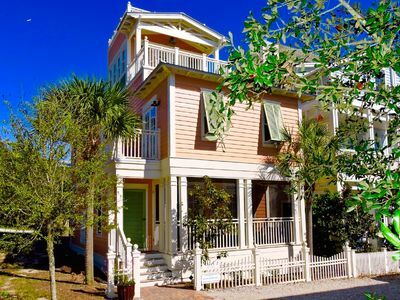 Overlooking the emerald green water of the Gulf are the pool and hot tub, gated for your privacy. An outdoor area for grilling is also provided for guests. The complex is gated and on site security is present during the high traffic season. Beach setups are available for rent during the active seasons. For a bit of exercise, try the third floor exercise room equipped with cross-trainers, treadmills, bikes, multi-station weight machines, free weights and TV. Want outdoor exercise? Bring your bike, rent one at the local shop, run or hike the 17 mile paved Timpoochee Trail that passes within a block of the building. Or, take a walk on the beach, either direction taking you to one of the rare coastal dune lakes found in our area. There are only four other places in the world that feature these dune lakes. 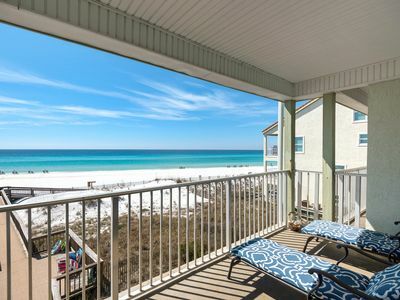 Walking on the famous sugar white sand of Blue Mountain Beach or listening to the calming sounds of the Gulf of Mexico are truly unique experiences. We look forward to having you as our guest. Please check the calendar for available rental dates. 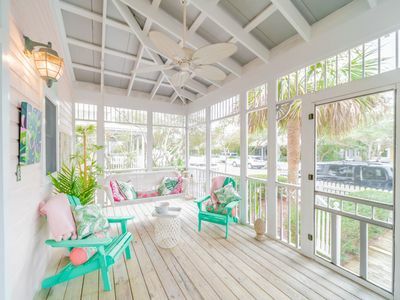 Newly Renovated ~ Close to Beach ~ Great Scenic 30A location! Gulf Place Caribbean 211 - Your spring NW Florida vacay awaits. 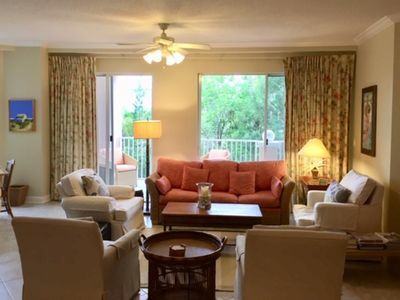 Tower w/Gulf Views, by Park & Family Pool, Short Walk to Beach in Seaside. 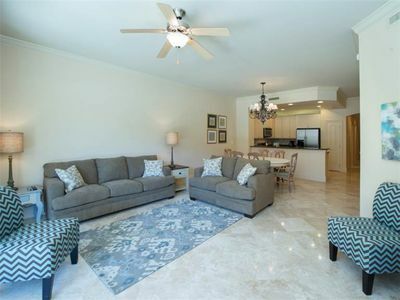 Gulf Front All Suite Stunner - Newly Renovated! 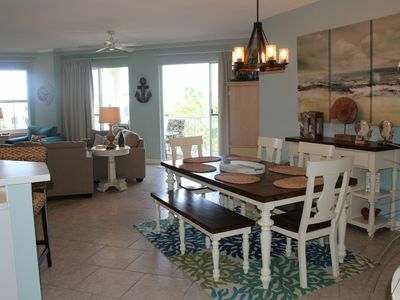 **Beautifully decorated** - steps to beach. Community Pool!! Great Spring Rates and New Remodel! Executive Access Home! 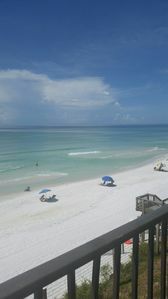 Beachside #3 - Amazing Beach Views! 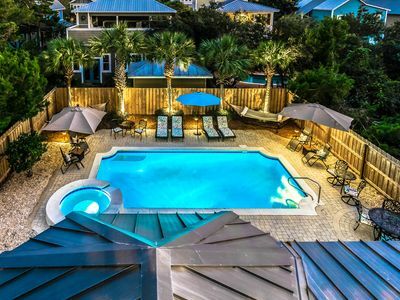 Bahama Breeze 30A Seagrove Beach Vacation Rental with PRIVATE POOL + FREE BIKES! 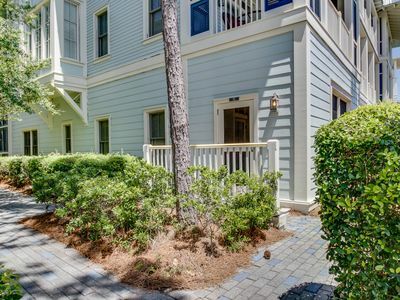 30A*NEWLY UPDATED*2 MIN WALK TO BEACH*WASHER/DRYER IN UNIT*PERFECTION!